I work at Ametsa with Arzak Instructions, the new venture of Juan Mari and Elena Arzak at The Halkin by COMO, London. 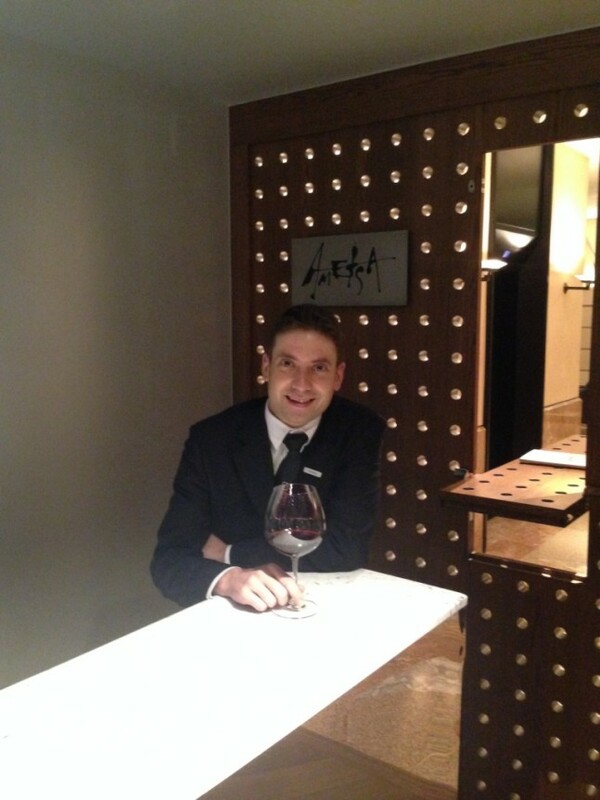 I hold the position of Restaurant Manager, working together with our Head-Sommelier Alvaro Prieto. I also teach future sommeliers in different schools across Spain. Ametsa is an exciting project to be involved in, being the first Spanish Restaurant ever to receive a Michelin Star in the UK, after being open to the public for six months only. Diverxo, in Madrid, the latest three-star Michelin Star Restaurant in Spain. The food was really memorable but for me the service stood out. They are a breath of fresh air in the restaurant business that is really needed – I think they don’t realise that! Atrio, in Caceres, Spain. They have a huge representation of wines from all over the world, and a spotless wine service. Actually, they probably have the biggest collection of vintages of Chateau D’Yquem around the world. I must say Mugaritz and Diverxo. Mugaritz because their philosophy blows your mind away, the depth of their investigation on ingredients in the kitchen never ends and Diverxo because they approached the restaurant in a uniquely new way. I like to try different places but there is one eatery I come back to over and over again. It’s the Diamante Restaurant in Marbella, which is owned by my friend Cristobal. They have some of the freshest fish and seafood you can find in Malaga. Other restaurants which I love are El Campero in Barbate, Cadiz, which serves the best tuna in the world. They have a tasting menu just made of different variations of tuna. Both of them are unpretentious restaurants, providing a warm and friendly service and high quality ingredients with reasonably priced dishes. Do you cook at home and is there a dish you have perfected? Yes I do like cooking at home. I have to say that mushroom risotto is my signature dish. Not really, I tend to try different places all the time to get new ideas on how to improve our own style and service. I like Merchants that never stop looking for new styles. Merchants that demonstrate an interest in our business – showcasing products from smaller producers. A good example of this is “de Vinos”, based here in London. Their main focus is on Spanish wines. Sherry wines, especially Amontillado and old Manzanillas, Burgundy red and German Riesling. Old Sherries. The complexity that they can achieve is infinite. And I will always remember my first 19th century experience with a Port Colheita from 1880 and a Pedro Ximenez from Montilla, Cordoba, in Andalusia from the vintage of 1910. Ageing through the years, those wines create a unique aromatic palette. Wines from Galicia in Northern Spain. Everyone knows Albariño, but there are many others really interesting grapes with tiny productions which give us brand new flavours white or red. For example Caiño (red and white), Loureiro (red and white), Doña Blanca or Merenzao. Really fine and elegant wines, with minerality and freshness. Tell us what is your ultimate wine bargain discovery in terms of price/quality rapport? (i.e. does not have to be cheap but over-delivers in quality for the price). Well, I hope not to be tiresome, but Sherries without a doubt are the best price/quality wines in the world. We can buy an amazing Amontillado over 30 years old in Jerez or Sanlucar for 30€. Wines with this age in another well-known wine regions can easily cost over 300€. I did a pairing by matching oysters with a Canadian Ice Cider, Neige, from the winery based in Hemingford, Quebec, La Face Cachee de la Pomme. Stephany and Francois are doing an amazing job there. The malic acid from the apples kept the sea taste of the oyster longer in the mouth at the same time this balanced the natural fat of the oyster. I never thought that I could match oysters with a sweet “wine”. 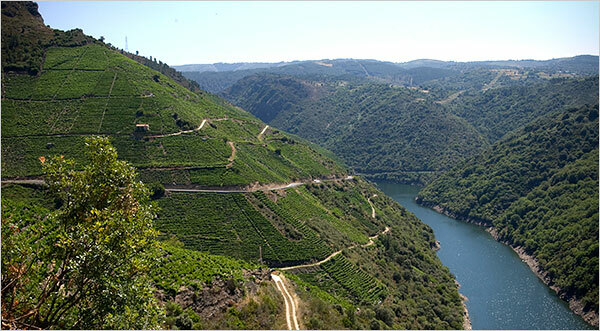 Ribeira Sacra, in Galicia. Most of them pick up the grapes in vineyards along the river on impossible slopes by small boats. And the gastronomy is quite satiating. Sacristia AB, from my friend Antonio Barbadillo in Sanlucar de Barrameda, Cadiz. Around 10 years old, it shows you the real dimension of Manzanilla. Absolutely round, without edges, golden colour, and great complexity, just perfect. Neige. An incredible Ice Cider from the winery “La Face Cachee de la Pomme”. Absolutely lively and playful, it goes with everything: cheeses, foie gras, chocolate, cakes, tuna, and even oysters! It’s nice as aperitif as the malic acid make the mouth salivate so we prepare the stomach for the digestion. Absolutely amazing. Seco Trasañejo from the winery “Malaga Virgen”, in Malaga. Over 30 years old. A wine for meditation. Candio 2008, from the winery “Suerte del Marques”. This is an incredible red wine made in Canary Island on volcanic soil. When you smell it, you believe to be inside the volcano. Absolutely mineral and elegant at the same time. White Rioja. Something to discover right now. I remember the white wines from the wineries “Agricola Labastida” and “Exeo”, like for example, Tierra Fidel (9 varieties) or Cifras (white Granache). Algueira Pizarra, from the winery “Adega Algueira”, in Ribeira Sacra and Caiño Goliardo from winery “Forja del Salnes”, both in Galicia. A good example of what in Galicia are able to do with the red wines.